West Seattle Natural Energy – one of our best customers who install solar throughout the Pacific Northwest. If you have a solar question, give them a call. No, I’m not writing a song or inventing a children’s playground chant. I’m talking about two of the flaws in conventional solar roof ventilation ideology. The idea of solar attic ventilation is fairly new and it is a great idea! Why not use the power of the sun to remove hot air in the summer and moist air in the winter? Many ventilation manufacturers immediately seized on this idea and have brought many products to the market as a result. As manufacturers raced for the lead and products began competing, many variations sprang up, most trying to squeeze the highest horse power out a solar panel to power the largest fan possible. When I’m telling others about Solar Blaster’s ventilation solutions, many times the first question they ask is, “What’s the cfm of your fan?” If they are competitors, after I tell them the answer, they begin bragging about their fan’s higher cfm. Laughing aside all the “bigger is better” analogies, I proceed to explain to them why my way of solar venting a roof is not only the best and correct way to ventilate an attic space, but also why it is the future of solar-powered roof ventilation. Large solar fans do not take into consideration roof design. Roofs are designed to passively pull air in from the intakes vents located at the eaves and exhaust the air uniformly from the highest possible point on the roof either by using multiple can-type roof vents or ridge venting. The keywords here are “uniform” and “multiple." Placing a large solar fan high on the roof in many cases defeats the purpose of the designed passive ventilation system. Large, high-cfm solar fans have to get their air from somewhere, and due to their power, will often rob air from the nearby ridge vent or can-type vents. They defeat the uniform air movement concept by leaving hot spots in many areas of the roof during the summer because they are no longer drawing air in from the eaves. During the winter, when hot air from your living space hits the cold roof decking in your attic, it condensates just like a can of pop. Without uniform air movement in winter to get rid of that moisture, your attic can often end up with mold which causes serious health problems. Many of the winter problems I see on a regular basis involve attic moisture problems caused by lack of uniform venting. The only proper way to work within the confines of the existing design system of your roof is to remove and move air in a uniform manner. So how do we do that? The future of solar-powered attic ventilation will include the use of multiple, smaller fans to uniformly remove hot air and moisture from your entire attic. In this respect, several smaller solar-powered fans do a much better job than one large solar-powered fan. High cfm solar fans give the wrong impression to homeowners. Even if the mathematics say you only need one of these super-duper high cfm solar fans to recycle your attic air so many times an hour, what happens when the sun isn’t shining? Your roof must have a passive vent system that works when the solar fans can’t. So there has got to be a better solution that enhances one’s passive ventilation. A small fan is not powerful enough to rob from the surrounding vents while strong enough to solar activate the passive vents to exhaust the air already searching for a high point. Multiple, small fans work in concert to move air uniformly across your entire attic length. Once air has begun to move in your attic through solar activation it tends to stay in motion. A solar-powered attic breeze reduces energy costs. Summer attic heat tends to transfer into living space because homes and insulation store loaded heat. Unloading this heat through uniform attic air movement increases your comfort and reduces cooling costs. Moisture in your structure and especially in your insulation reduces its effective R-value, thereby increasing your heating costs. The invention of the first true solar-powered ridge vent, the Solar RIDGEblaster, has revolutionized the way people ventilate because it uses the very highest point on your home to exhaust air. It uses a 10-watt panel to power three small 2.7 watt fans. As soon as the panel captures enough energy, it will power the first fan even on most cloudy days. On full sunny days, all three fans kick in to really move that attic air and boost the effectiveness of your passive vents. Can you tell me your large solar attic fan works on cloudy days? I didn’t think so. Solar activating your existing can vent system means that your passive can vents work as they are supposed to according to the design of your roof even under thick cloud conditions. But when the sun comes out. Whammy! Air begins to move more quickly through your existing design system by the power of the sun. Utilizing the existing passive ventilation system protects the aesthetic aspect of your home by not adding unsightly large solar-powered fans. It also works in conjunction with what your roofing contractor is already installing on your home – conforming to local and national building codes. There are also tax credit advantages available on a federal level which includes both material and installation labor. The use of multiple, smaller solar-powered fans is the only correct way to properly power assist venting of your attic space and is the future of roof ventilation. Dan Rheaume is the owner of Raynproof Roofing, a residential roofing company in Seattle, Washington since 1986. In 2009, he started the Solar Blaster Corporation and is the nation’s leading expert in the use of multiple, small, solar-powered fans that will revolutionize the way homeowners ventilate their roofs. Why Should I Care About My Attic's Ventilation? Crawling through my aunt’s attic as a child I told my brother to wait while I proceeded on my hands and knees. “Wait, I’ll go first, it might be dangerous.” Then I fell eight feet to the concrete floor through the sheet-rock and broke my wrist. Yes, it was dangerous. That dark, dank space above our heads certainly has a mystery and danger that even a child can recognize. But even as an adult, there are many dangers you may not suspect or be aware of. Your attic is an environment of its own, designed by architects and builders. Modified territorially to fit the climate and modified by time as we learn new technology. Although most of us choose to ignore the space we live under, I have chosen your attic as my life’s profession and passion. You see, I’m a roofing contractor that makes his living tearing off the roof of your most prized and valuable asset – your home. People ask me if I tear roofs off in the winter. I tell them, “Yes, I still have bills in the winter.” Joking aside, tough winter climates and conditions are the true test of your roofing system. As a contractor, I can tell you winter exposes and exacerbates ANY weakness your system might have. Your attic space is an essential part of your roofing system. Warranty issues are problems for both the contractor and the homeowner. Our goal as a contractor is to give the homeowner a roofing system that will last the promised life expectancy with zero problems. It is a homeowner’s responsibility to maintain their roof system. These maintenance responsibilities can include simple things such as cleaning, caulking, and removal of moss and debris. Moving air through your attic space is also an essential part of maintaining your roof. A warranty problem creates stress for the homeowner and a trip to the home by the contractor. Over the years many of the issues I have faced as a contractor are due to moisture and heat. Winter moisture and summer heat are two of the largest contributing factors to premature aging of your roof and your entire building envelope. The barrier between the outside elements and your inside comfort is your ATTIC! So why should you care about what happens in your attic? Modern homes are designed for proper venting. Your modern home is designed to uniformly pull fresh air IN at the eaves and exhaust bad air OUT the openings at the top of your roof. That means in the summer, cool air in and hot air out. In the winter, cool air in and moist air out. Your home’s attic system moves air by convection: hot air rises pulling air into the vents located low on your roof and exhausting it out the vent system located high on your roof. While this system works to remove air in the summer many times, because of the lack of convection, it does not work in the winter. There are several ways that roofing contractors use to vent your roof, and in most cases these venting systems comply with the local building code. The two most common venting systems are the ridge vent style of venting and the can vent style of venting. Many manufactures are now recommending the ridge vent style as it uniformly vents your home from the highest point on the roof, while also venting the entirety of the ridge area. Regardless of the age of your home, a roofing contractor can help you design a system that works for your home and properly vents hot summer air and moist winter air. The key to good ventilation is uniform air movement from eave-to-ridge across the entirety of your attic space! Open your attic hatch in your home and, depending on what type and if you have insulation, you can usually expect something to fall from that space and make a mess. Insulation loft is an essential element to the effectiveness of insulation and, depending on your area, you will have codes to tell you how much you need. Moisture destroys the effectiveness of this insulation. In fact, a percent and a half of moisture in your insulation reduces the effective R-value of your insulation by 33%. Moisture from breathing, living, cooking, laundry, and showering all transfer through your living space into your attic and must go somewhere. Most often, its first stop is your insulation. Combine cold atmospheric conditions with hot air coming from your living space and you attain condensation. As a contractor, I have literally seen water dripping from the interior boards and roof decking in winter conditions. Many of the warranty issues I have dealt with over the years come from condensation dripping onto insulation and then traveling through to become visible interior stains. YUK! No one likes stains, nor the resulting mold. Mold spores produce allergens which can and will cause health problems. Non-vented, moist air in the attic can also lead to wood rot, warped decking and certainly added expense to any roofing project. Not to mention the degradation to the building envelope itself. Try selling your home and hiring an inspector only to find out you have thousands of dollars in wood replacement costs before you can even list your property. Proper venting is cheap insurance and by spending a few dollars up front you can have a healthy, fresh, moisture-free attic. Keeping moisture out of your insulation alone can offer you immediate savings to your heating bill putting money directly back into your pocket. Your composition roof surface is generally a mat material base with asphalt impregnated into it and a granular surface added for color and protection. This asphalt surface retains heat. UV sun rays and heat are one of the many conditions that decrease roof life expectancy. Removing heat is key to maintaining and preserving your roof. On a 90 degree, sunny day, your roof surface can reach beyond 170 and your attic space can reach temperatures of over 150 degrees. That is literally like having an oven over your head. Have you ever wondered why your home is so hot in the evening hours after the hot sun has gone down? Your building, roof, and insulation loads up with heat. As this heat unloads it transfers that loaded heat into your living space. Heat can transfer down into your living space, decreasing your interior comfort and increasing your cooling costs. Uniformly removing this heat is essential for the protection of your home’s building envelope and the protection of the roof surface itself. Power activating your existing vent system through the use of several small, solar-powered fans can be a solution to your heat and moisture problems emanating from your attic space. By managing attic air flow now, you can benefit through increased comfort and health not to mention the energy savings. The future of attic ventilation is here now. Great article on why mixing attic vents is a bad idea! Mixing different kinds of attic exhaust ventilation is a really unwise decision. Ron Hungarter explains the reasons why this doesn’t work. Definitely a good read. 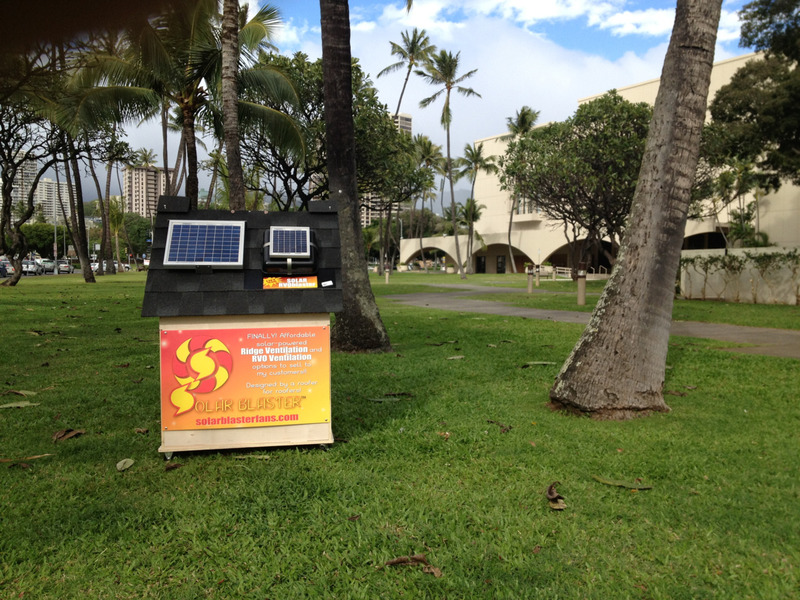 Solar Blaster just got back from exhibiting at the Hawaii Buildings, Facilities & Property Management Expo in Honolulu on March 7 & 8. This expo offers convenient and efficient access to a broad variety of products, services and equipment needed by the owners, managers and operations personnel of Hawaii’s buildings, facilities and property management companies. Solar Blaster’s RIDGEblaster and RVOblaster ventilation products were a HUGE hit being the newest and latest product to hit the shores of Hawaii. 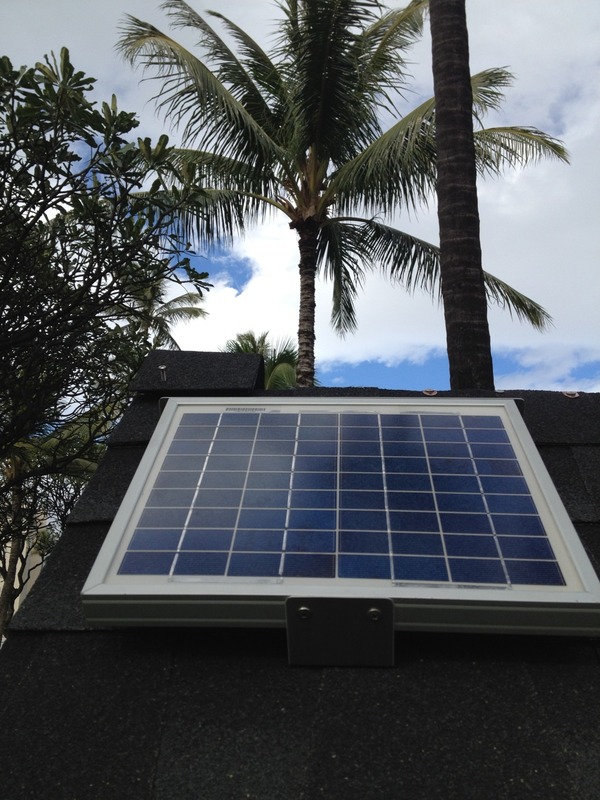 Roofers and contractors were excited to start using both products on their homes across the islands. We are really excited that our products will be available via Allied / RSI stores staring in Honolulu and coming to the other islands soon.